Giggles Embroidered Bib | Multicolour | Helps to protect baby cloth from getting stain. 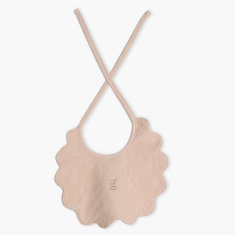 Tie this scalloped-edged bib around your kid's neck while feeding to ensure that your baby's clothes do not get stained. It highlights a press button closure at the back to lend a comfortable fit around the neck.